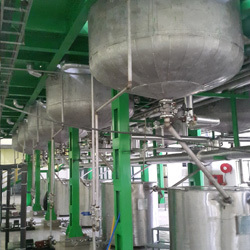 Fueled by innovation Servotech India Ltd is one of the leading name in undertaking Turnkey Projects for Solvent Extraction Plant, Tea Extraction Plant, Spice Extraction Plant, Vanaspati / Hydrogenation Plant, Acid Oil Plant, Castor Oil Plants, Lecithin Plants, Cattle Feed Plant, Feed Milling Plant, Dry Fractionation Plant, Oil Mill / Expeller, Cotton Seed Processing Complex, Vegetable Oil Refining Plant, Bio-diesel Plant and Oleo Chemicals Plant for Agriculture based industries. We have been successfully catering to the ever growing demands of our international clientele from oil and gas industry. Our technocrats and engineers are specialized in providing turnkey solutions, which include complete services right from conceptualization to commissioning of the plants. We also provide excellent after sales services and support to ensure hassle free performance of the installed plant.